The 50-room Marble House, one of the first Beaux-Arts structures in the US, was built between 1888 and 1892 as the Gilded Age summer cottage for William and Alva Vanderbilt. Inspired by the Petit Trianon in Versailles, the $11 million mansion made mostly of marble became a National Historic Landmark in 2006. The Preservation Society of Newport County operates 11 Newport Mansions properties, including Marble House. 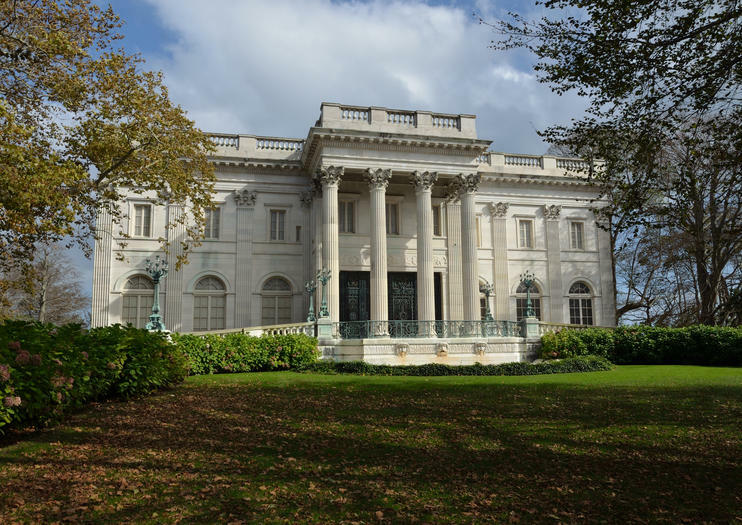 A single house admission ticket to Marble House includes an audio tour, but you can also opt for a 2- or 5-house ticket, if you plan to visit other properties, including The Breakers, The Elms, or Rosecliff. Many guided Newport Mansions tours, including day trips from Boston, package entrance to both Marble House and The Breakers. Marble House is a must-visit for history buffs and first-time Newport visitors. Wear comfortable walking shoes and be prepared to climb stairs. Give yourself about an hour to 90 minutes to tour the house. Marble House is partially wheelchair accessible. While most visitors drive to Marble House and other Newport Mansions—there’s free off-street parking at all but Hunter House—it’s also possible to ride the Rhode Island Public Transit Authority trolley from the Newport Visitors Center. Most of the houses are within walking distance of each other. Marble House is open daily throughout the year, though hours change depending on the season. Since Marble House kicked off the trend of building lavish mansions in Newport, it’s a good one to see first, if you’re planning to tour more than one historic property. William Vanderbilt, grandson of steamship and railroad tycoon Commodore Cornelius Vanderbilt, gave Marble House to his wife Alva as a gift for her 39th birthday. By 1895, the couple had divorced, and Alva moved down the street to Belcourt. Upon William’s death, she returned to Marble House before eventually selling it to Frederick H. Prince in 1932. In 1963, the house became the property of the Preservation Society.